In a medium bowl, combine cream cheese, oregano, chili powder, and pepper jack cheese; blend well. In a pot of simmering water, blanch the pepper halves for 2 minutes, drain and dry thoroughly with paper towels. Spoon the cream cheese mixture into jalapeno pepper halves. Combine milk and egg into one bowl; in another combine flour and salt. Dip the stuffed jalapenos first into the milk then into the flour, making sure they are thoroughly coated. Place the coated jalapenos on wire racks and let dry for about 10 minutes. 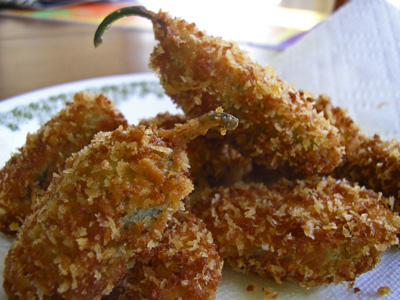 Dip the jalapenos in milk mixture again and then roll them in breadcrumbs to coat. Let coated peppers dry for 30-40 minutes, repeating the dipping in milk and rolling in breadcrumbs if necessary. In large skillet, heat the oil to 365 degrees F. Deep fry the filled and coated jalapeno peppers 2 to 4 minutes each, until golden brown. Remove and let drain on a paper towel. To freeze, DO NOT FRY PEPPERS. Place on cookie sheet and freeze until hard, then package in single layer in plastic freezer containers. To eat, place on cookie sheets and bake at 350 degrees for 20-30 minutes until hot all the way through, golden brown, and crisp. Or you can fry the frozen poppers; add 1-2 minutes to the frying time. Makes 25 appetizers .